Go ahead. Give your love some chocolates on Valentine’s Day. It turns out that chocolate has plenty of attributes that make it heart healthy. The darker the better. So, give the gift of chocolate and don’t feel too guilty if you indulge in some chocolate yourself. Below are some heart-healthy chocolate recipes. Cocoa butter is a naturally occurring plant fat from cocoa beans. Cocoa butter does not raise cholesterol even though it is high in saturated fat. Cocoa butter contains 35 percent stearic acid (a saturated fat), 35 percent oleic acid (a monounsaturated fat), 25 percent palmitic acid (a saturated fat), 3 percent linoleic acid (a polyunsaturated fat) and 2 percent other fat. Stearic acid is an unusual saturated fatty acid because it does not raise cholesterol like other saturated fats, which are mostly from animal sources. After absorption, stearic acid is rapidly converted to oleic acid, a monounsaturated fat that does not raise cholesterol. Chocolate is very concentrated in a type of antioxidant called flavanols. Dark chocolate is more concentrated in flavanols than milk chocolate, since milk chocolate is “diluted” with milk. 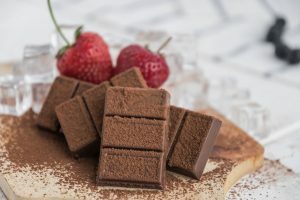 Flavanols from chocolate decrease inflammation, reduce platelet activity, improve immune function and expand arteries, which increases blood flow. Epicatechin, a type of flavanol found in high concentrations in chocolate, can relax blood vessels and improve blood pressure. Manufacturing processes and alkalization can change the flavanol content of chocolate. Mars, Inc. has a proprietary method of processing cocoa beans so that the natural levels of flavanols are retained in their chocolate products. These products are labeled with the Cocoapro™ mark. Hot cocoa contains more antioxidants per cup than a similar serving of red wine or tea. Hot cocoa releases more antioxidants than what is found in cold chocolate milk. Cocoa powder is high in several minerals: calcium, copper, iron, magnesium, and potassium. These minerals in particular are beneficial for preventing and controlling high blood pressure. Dark chocolate also contains fiber, which can help lower cholesterol, and is more concentrated in the above minerals and fiber than milk chocolate. For the most health benefits, purchase chocolate that contains 70 percent or more cocoa and few if any other additives. Caramel, nuts, marshmallows, etc. just add more calories and dilute the health benefit of the dark chocolate. Healthy dark chocolate should only contain the following ingredients: chocolate, sugar, cocoa butter, soy lecithin and vanilla. This recipe is a great way to use over-ripe bananas. The bananas provide extra flavor and sweetness, so less sugar is needed in this recipe. The flavor combination of banana, oatmeal and chocolate is delicious. Consider using these cookies for a quick healthy breakfast along with a glass of low-fat milk or a container of low-fat yogurt and some fresh fruit. Preheat oven to 350°. Combine first four ingredients in a small bowl and set aside. Combine brown sugar and next five ingredients in a large bowl, and beat mixture at medium speed of a mixer until well blended. Stir in oats and chocolate chips. Let stand 5 minutes and then stir in flour mixture. Drop dough by heaping tablespoons full of dough two inches apart onto baking sheets coated with no-stick cooking spray (or use no- stick baking sheets that don’t require cooking spray). Bake at 350° for 10-12 minutes or until lightly browned. Allow cookies to cool on the pans for 5 minutes then remove cookies from pans and cool completely on wire racks. Makes two dozen cookies. Dried fruit and chocolate are a perfect combination. The dried fruit is intensely sweet and helps to satisfy your craving for sweets but counts as a fruit serving. Adding a small amount of good quality chocolate helps to satisfy your desire for chocolate without eating a whole candy bar. This recipe is so simple, but your friends will think you purchased it from a fancy candy shop. Store for up to one month (if they last that long) in the refrigerator. Melt chocolate in a medium microwave-safe dish (about 2 minutes, stirring every 30 seconds) or in a double boiler. Holding one apricot at a time, dip half of the apricot in melted chocolate. Cool on a cookie sheet covered with waxed paper in refrigerator or freezer. Store in refrigerator until 30 minutes before serving. Makes 13 servings (serving size: 4 dipped apricots). This recipe was adapted from Cooking Light, March 2008 and was a winner of the Ultimate Reader Recipe Contest. The reader who submitted the recipe was Fort Collins resident, Barb Combs. Way to go Barb – the people of Fort Collins do love chocolate! I love this cake recipe because it doesn’t have the extra calories from a thick frosting; a light glaze is used instead. This will be your new favorite chocolate cake. For a real treat, serve with mixed fresh berries. To prepare glaze, combine the first 4 ingredients (sugar through butter) in a small saucepan. Bring to a boil over medium high heat, stirring constantly. Set aside and cool completely. Preheat oven to 350°. Thoroughly coat Bundt pan with no-stick cooking spray for baking. Cream spread and granulated sugar together in the bowl of an electric mixer at medium speed until well blended (about 5 minutes). Add eggs, one at a time, beating well after each egg. Add vanilla and mix until well blended. In a large bowl, combine flour, cocoa powder, baking powder and baking soda; stir with a whisk. Add flour mixture and milk alternately to sugar mixture, beginning and ending with the flour mixture; mix after each addition. Beat mixture an additional 2 minutes on low-medium speed. Fold in mini chocolate chips. Spoon batter into prepared pan. Swirl batter using a knife. Bake at 350° for 45 minutes or until a wooden pick inserted in the center comes out clean. Immediately pour glaze over cake. Allow cake to cool in the pan on a wire rack for 30 minutes. Invert cake onto a serving plate; cool completely. Sprinkle with powdered sugar just before serving. Makes 20 servings (serving size: 1 slice). Hot chocolate is actually a very nutritious beverage. The antioxidants from dark chocolate along with calcium and other essential minerals from low-fat milk come together to form creamy, chocolaty deliciousness that is also heart healthy. Making your own hot cocoa puts you in control of how sweet it will be and what kind of sweetener you want to use. It is one of my favorite ways to drink a cup of milk. Mix all ingredients together in a saucepan. Heat over medium heat, stirring constantly, until chocolate is melted and mixture is smooth. Makes 2 cups (serving size: 1 cup). “Your peanut butter is in my chocolate; your chocolate is in my peanut butter.” Either way it is a delicious flavor combination. This recipe gives you a healthier way to make your own homemade candy bars. Peanuts and natural peanut butter provide heart healthy monounsaturated fat and fiber. For variety, try different nut butters such as almond butter or soy nut butter. Add different nuts and maybe dried fruit such as dried blueberries or cranberries – yum! Melt chocolate chips in a large microwave-safe dish (about 2 minutes, stirring every 30 seconds) or in a double boiler. Add peanut butter and stir until well blended. Add cereal and nuts; mix well. Line a 9×13-inch baking pan with aluminum foil. Lightly coat foil with a no-stick spray. Press chocolate mixture into the foil-lined pan. Let stand for 1 hour or until firm. Before cutting, chill in the refrigerator for up to 30 minutes. Cut into squares with a sharp knife or a pizza cutter. Makes 32 squares (serving size 1 square). This treat is fast, easy, delicious, and best of all loaded with heart healthy nutrients. Dark chocolate along with the dried cherries are full of healthy antioxidants. The sweetness from the dried cherries helps to satisfy your sweet tooth. The almonds provide heart healthy monounsaturated fat, cholesterol lowering plant sterols and a crunchy texture. Change the recipe around by trying a variety of dried fruits and nuts. Fresh berries such as blueberries or chopped strawberries would also work in place of the dried fruit. Melt chocolate in a large microwave-safe dish (about 2 minutes, stirring every 30 seconds) or in a double boiler. Add dried cherries to the chocolate and stir gently to coat. Cover a baking sheet with wax paper. Mound 4-5 almond slivers into 20 little piles on the baking sheet 2-inches apart from each other. Spoon cherries and chocolate on top of the almonds (about 1 tablespoon); evenly distributing the cherries. Using two spoons shape into a cluster. Chill for 45 minutes or until firm in the refrigerator. Store in the refrigerator in a wax paper lined container. Makes about 20 clusters (serving size: 1 cluster).